In my experience, I have found that most family gatherings go far more smoothly than they otherwise might when given some forethought and careful planning. So with the season of extended family gatherings upon us, here are just a few suggestions to help make your holiday family time together more relaxing and enjoyable for all. This first suggestion may seem like it should go without saying, but when I feel the holidays closing in on me, I sometimes get distracted from the very thing I need most—serious spiritual nourishment. So if you’re like me, strive to make an extra effort to prepare spiritually before the company arrives. Try praying for specific guidance about how to make a particular family member feel included. Study general conference talks that may be of special interest given the impending family gathering (for example, talks on forgiveness if there have been hurt feelings in the past). In my case, I find great comfort and inspiration in listening to Mormon Tabernacle Choir CDs while I clean the house and otherwise prepare. Taking such measures to prepare spiritually ahead of time can do much to set the stage for the gathering and to invite the Spirit to be present throughout. I will never win an award for being a domestic diva. But, I can tell you from first-hand experience that the more I prepare ahead of time for a family get-together, whether that get-together is at home or away, the more I can relax and enjoy the gathering itself. If you want to relax more and stress less when the gathering is held in your home, strive to keep things as simple as possible and make good use of to-do lists. When it comes to food, stick to tried-and-true recipes and do as much shopping, cooking, and baking ahead of time as possible (many breads and desserts freeze quite nicely). And to make things even easier, consider extensive use of crock-pots to slow cook and keep food warm. My all-time favorite slow-cooker cookbook is Fix-It and Forget-It: Feasting with your Slow Cooker by Dawn J. Ranck and Phyllis Pellman. And another great one with super-simple recipes is 101 Things To Do with a Slow Cooker by Stephanie Ashcraft and Janet Eyring. When attending a gathering away from home, create a detailed family packing list to avoid the stress caused by forgetting to take something important like a camera or a pair of Sunday shoes. Be sure to include items that will make the road trip or flight more enjoyable for everyone. My family loves to listen to audio books during our longer road trips. Two of our favorites are Being the Mom by Emily Watts, and Milly, Molly, Mandy by Joyce Lankester Brisley. Remember to pack plenty of reasonably healthy snacks and drinks (not just fudge and peanut brittle from the neighbors), as few things make family members (on the road and at the destination) grumpier than having an empty stomach or being filled to the brim with junk food. Make a point of choosing one small but meaningful non-tangible gift you can focus on giving others when taking part in your next family gathering. By non-tangible, I mean a gift you cannot put your hands on or wrap, but one that can make a positive difference in the quality of the gathering. You may want to consider giving the gift of being an especially attentive listener when others are talking or of consciously looking for the good in others and sharing sincere compliments. One of my favorite gifts to give now that my children are getting a bit older is to spend time with the little ones at the gathering, enjoying their company while giving their moms and dads a break. Intentionally giving such non-tangible gifts can make a positive and powerful impact at family gatherings. I admit it—I am a true idealist, often imagining family gatherings that are closer to perfect than is, generally speaking, ever possible. But I also realize that sometimes the best thing I can do to make a gathering more enjoyable for me or others is to simply revise my expectations of the gathering and of those in attendance. For example, I used to think that when my family—including my parents and my sisters and their families—came together, we had to be with each other 24/7 to make up for all the time we miss out on by living in cities scattered across two continents. This expectation put tremendous pressure on me whenever I served as a hostess and I now realize made things rather intense for any guests in my home as well. Recognizing this, I have revised my expectations to allow my guests to spend time on their own, resting or taking a leisurely outing, and to give myself permission to break away when I need to get some rest or simply have some time to myself. This one simple revision of my expectations has made the gatherings less stressful and much more enjoyable. 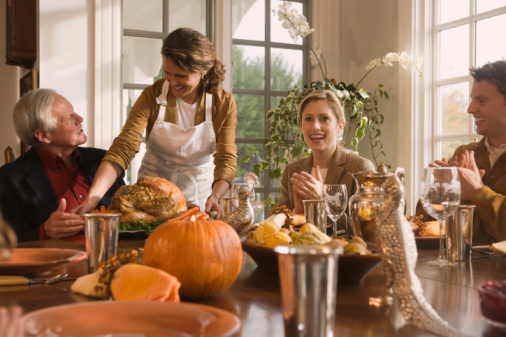 How can you revise your expectations to alleviate frustration and increase harmony at your next family gathering? What about accepting that if young children are going to be present, the gathering is going to be extra lively, or asking for help in the kitchen rather than automatically expecting it? Sometimes, our expectations of family gatherings are right on target and other times, revising expectations may be just what is called for to make the gathering more pleasant for everyone. When it comes to family relationships, it can be all too easy to fall into a reactive mode when hot buttons are pushed. Even so, if we will choose to consciously act instead of react when our feathers are ruffled, we will do much to maintain harmonious family relationships by avoiding doing and saying things we would very likely regret later. This does not mean that acting instead of reacting comes easily. Nonetheless, and not surprisingly, it often takes just a small shift in one’s perspective and choices to make a significant and positive difference in touchy situations. I learned this lesson some years ago when attending extended family gatherings. Whenever I ran into a particular family member, I was bombarded with criticisms about everything from the way I dressed to the way I cooked meals and cared for my children. Initially I reacted by vigorously defending myself, but instead of diffusing the criticisms, my reactive response served only to feed the negativity hurled my way. Recognizing the message behind the criticisms, I decided that as much as there was to like about this relative (and there really was a lot), I didn’t have to be like her to be okay. With that, I no longer felt the need to defend myself so emphatically. Instead of reacting to her negativity, I acted by setting a tone of sharing sincere compliments with her and by simply letting the negative comments slide when made. Interestingly, once I undertook this approach, my relative’s negative comments occurred with less and less frequency until, over time, they became virtually non-existent. Just remember, when hot buttons are pushed be sure to pause long enough before responding to choose the best path possible through whatever sticky or hurtful situation you may face. I don’t know about you, but when my family comes together, it’s pretty much guaranteed that I will get less sleep, eat less healthy, and generally neglect my own self-care. A day or two of such poor self-care doesn’t bother me much, but more than a couple of days exhausts me and makes me downright grumpy. So if your family gatherings are like mine, make a point to take better care of yourself in the midst of all the fun and craziness. Try to get sufficient rest by calling it a night at, say, eleven rather than one or two in the morning, and seek to nourish your body with a few more fruits and vegetables and a few less sweets. In terms of emotional self-care, think about making time at the end of each day to write in your journal to process that day with your family—the good and bad. Taking such time almost invariably guarantees a more restful night’s sleep. Just remember to have fun despite and blips that may come along and keep this old adage in mind: “Don’t sweat the small stuff; and remember, it’s all small stuff. Get the kids involved up front by inviting them to help prepare for the get-together. Ask them to make cookies or brownies ahead of time and freeze them. Maybe assign them to make placemats or a special banner to welcome everyone. Let the kids provide the entertainment. They can hold a talent show, perform a skit, or lead some sing-alongs for the entire extended family. It’s always fun to see the growing talents of the younger generation. Play games that stimulate conversation and encourage the sharing of memories and family history. Two excellent resources for this kind of activity include the Life Stories board game and Food for Talk (both available at amazon.com and other online retailers). Get outdoors with the kids. A family kickball game is low on equipment needs but high in the fun-and-good-laughs category. Or hold your own Thanksgiving or Christmas parade and invite them to bring their bikes and wagons and dress in costumes for the occasion. Be sure to hold a family home evening several weeks before the gathering where the kids brainstorm ideas for creating their own fun at the gathering. If any cousins live close, combine the family home evening. They’re likely to surprise you as they do their part to make the gathering a great success for all.